When I started writing about bike selection more than a year ago (it’s now January of 2010), I didn’t expect the narrative to be nearly so long nor so complex. And as recently as two months ago– in Pilgrims Progess(ion)— I thought the last line had been recorded, at least for a year or so. But then some of my online friends began to fantasize about a big, long haul ride, drawing motorcyclists from across the eastern half of the nation. We would converge on New England and ride together to Canada’s Prince Edward Island. For me, from my home near Atlanta, that would be a roundtrip of more than four thousand miles. For some others expressing enthusiasm for the adventure, it would be even longer. And I noticed that most of those brave souls were owners of motorcycles designed for just such ambitious touring. Yes… I can see you’re getting ahead of me already: And you’re right; I did, in fact, decide to investigate the super-sleds, the rolling rocking chairs, the monster touring bikes. Coincidentally, at about the same time, I began to take long, enjoyable day rides with a group called the AME– the Atlanta Motorcycle Enthusiasts. This is the collection of riding companions I had yearned to meet someday, but whom I also believed were as likely to exist as leprechauns or unicorns. They are mature, responsible, serious-minded adults with no ambition to set records of time or distance or speed, but who simply enjoy getting together to ride to interesting and/or exciting places. They often make overnight trips– for example, the run from Atlanta to Cape Canaveral to watch a launch of the Space Shuttle. New Years Day, 2010: The AME joins The Blue Knights for their annual "Cold Buns" ride. 65 bikes toured the east Georgia countryside with a stop for lunch at a rural inn. 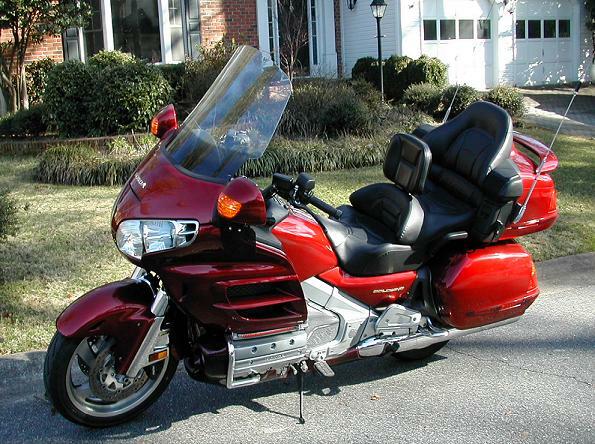 You should be warned, the Honda Gold Wing is a living legend of motorcycle comfort and elegance. Some snobs would even cite it as opulent. In its latest iteration– and there have been several over the last 35 years– “The Wing,” as it’s called, sports a six-cylinder Honda crafted engine that’s bigger than the powerplants in some cars. It typically comes equipped with CB radio, AM/FM stereo, CD player, cruise control, a height -adjustable windshield, tunable suspension, and a plush passenger seat pre-wired for inter-com chats with the driver. Frequent options include anti-lock brakes (ABS), heated seats and handlebar grips, and an integrated GPS display. Some younger purists refer to it as “The Rocking Chair,” referring to its popularity among “‘more seasoned” riders. But those who know it well and ride it often call it “The Rocket Chair.” And yes, you are correct: it comes with an appropriate price tag. That steep tariff for ownership explains why I limited my serious shopping to Gold Wings built in 2005 or earlier years; it was the limit of the budget imposed by my bookkeeper wife. And it turned out to be fiscal wisdom. I searched the web for likely candidates to become my new roadway companion. The prime criterion was that the bike have the safety attribute of ABS. There are many things you don’t want to do on a huge, heavy motorcycle, and going into a skid is right at the top of the list. 2004 Honda Gold Wing GL1800 ABS: I rescued her from the snows of Ohio and brought her home to the southland. I call her Scarlet O'Honda because in Georgia, when it comes to winter weather, frankly, my dear, we don't give a damn. I’m pleased with and proud of the several long trips I’ve been able to take in slightly more than a year of motorcycling. But none of those roads was nearly so long and (as bikers say) so twisty as the one to choosing the ultimate machine. I believe I have reached that destination, and it has been a glorious ride… from one cylinder to six… from loud and sporty to formal and sedate… from a 350-pound street toy to 900 pounds of turnpike tourer. Along the way, in sixteen months, I’ve ridden appreciable distances on ten different sizes and styles of two-wheel conveyances– mine and Delcia’s. But now I have stopped looking for that next experience because I have the best of both worlds. In great part that is due to a generous concession from the earlier mentioned tight-fisted wife. As she explains it, she likes the notion of my riding a powerful and comfortable cruiser when I go off to play with my friends on distant highways (Prince Edward Island being a case in point), but when she climbs on her big V-twin to ride with me around town or to wander with friends, she’d rather see me on the classically styled Big Beauty— my magnificent C90T. So she suggests that I keep them both, Scarlet and Beauty, and she leaves me to my own devices for assuring harmony between my rival sweethearts. Damn. You can write :). I read most of your articles. Do you have any books out? No books. I plug away at the blog because I know it reaches people with an interest. Writing and publishing books involves all those other people who think the romance of the road is a shack-up in some highway motel. Just lazy, I guess, but I don’t need the hassle of explaining it to folks who wonder why the dog sticks his head out the car window. Thank you for appreciating what I do for folks just like you… and me. I’m not sure what you mean by “a hard time,” Wing. It’s not my favorite transition, either, but here’s how it works. My wife is significantly younger than I am. She gave me her okay to buy the wing for my long, solo road trips. After I got it, I asked her if I had to sell the (C90T) cruiser now. She said, “No. You ride the Wing when you’re off having fun. But when you ride with me, you get off that olde farte bike and ride the Suzi.” Maybe I should point out… my wife rides a Harley Softail.